August is “National Moonshine Month” (not really) so it’s fitting that John Hillcoat’s new feature, Lawless, will debut at the end of it. To wet your whistle, we’ve got a couple of new posters for the Prohibition era flick, along with an infographic on the history of the spirit known as White Lightning. In addition, we’ve got soundtrack details for the film so that you can crank up the tunes while outrunning the law in your old jalopy. 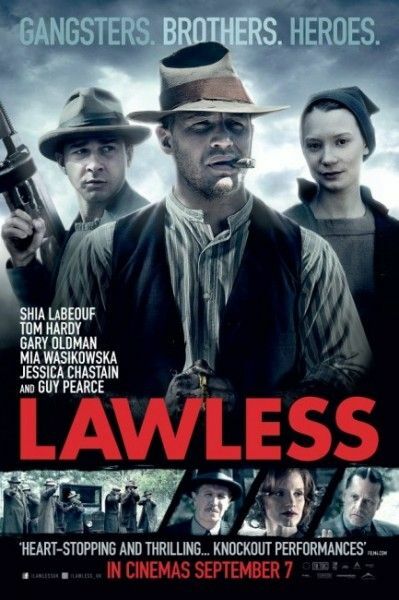 Starring Tom Hardy, Shia LaBeouf, Guy Pearce, Gary Oldman, Jessica Chastain and Mia Wasikowska, Lawless opens August 29th. Hit the jump to check out the posters, infographic and details on the soundtrack.